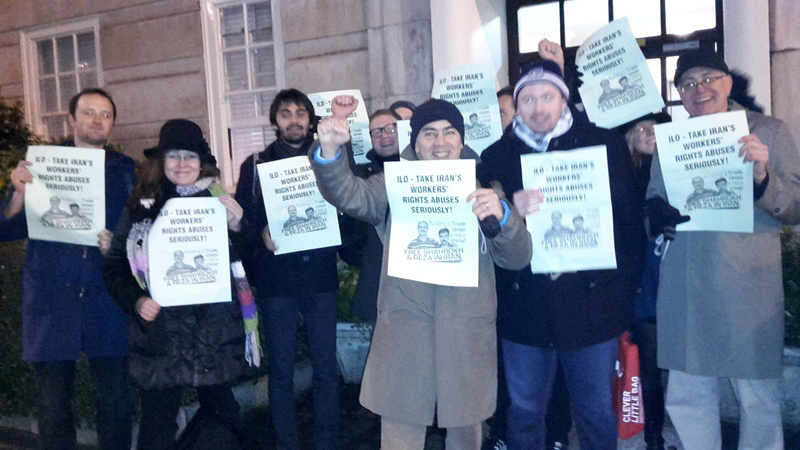 On Friday 16 January campaigners met at the official address of the International Labour Organisation in London to hand in a letter calling on the ILO to take Iran’s workers’ rights abuses seriously. The ILO allows Iran to remain a signatory to core conventions and allowing delegations from non-independent state unions to attend ILO conferences. Iran has ratified five of the eight core conventions, it has not however ratified C87 (Freedom of Association and Protection of the Right to Organise Convention), C98 (Right to Organise and Collective Bargaining Convention) or C138 (Minimum Age Convention). We argue that the freedom of association and right to organise independent trade unions are fundamental labour rights. Iran should be not be let off the hook on these principles. The ILO states that for the core conventions “all Members, even if they have not ratified the Conventions in question, have an obligation arising from the very fact of membership in the Organisation to respect, to promote and to realise, in good faith and in accordance with the Constitution, the principles concerning the fundamental rights which are the subject of those Conventions”.